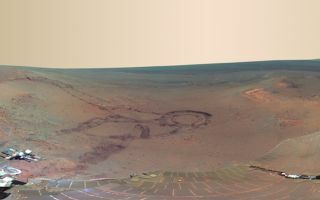 This full-circle scene combines 817 images taken by the panoramic camera (Pancam) on NASA's Mars Exploration Rover Opportunity. This full-circle scene combines 817 images taken by the panoramic camera (Pancam) on NASA's Mars Exploration Rover Opportunity in this cool space wallpaper. It shows the terrain that surrounded the rover while it was stationary for four months of work during its most recent Martian winter.